San Francisco Gets A Taste Of Robotic Food Delivery - Integration Through Media ....! SAN FRANCISCO, (AFP): San Francisco startup Marble on Wednesday began giving its home town a taste of restaurant orders delivered by robot, confident that appetite for such service will grow around the world. 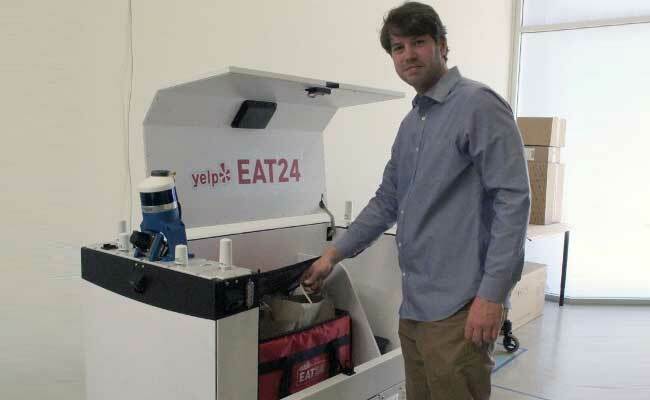 Marble partnered with take-away meal ordering mobile application Yelp Eat24 to put its boxy, wheeled robots to work handling local deliveries for some restaurants in the Mission and Portrero Hill districts of San Francisco. “It’s the real deal,” Marble co-founder and chief Matthew Delaney told AFP while providing a demonstration of one of the robots at the startup’s offices in Portrero Hill. Marble is starting with a “handful” of robots and keeping it opt-in when it comes to whether machines handle deliveries. Food orders are locked into robot cargo compartments large enough to hold about four standard shopping bags. Marble robots, the current generation named “Happy” and numbered, roll along sidewalks and cross streets at walking speeds, relying on lasers, cameras and other sensors to maneuver. The technology involved is similar to that used in self-driving cars. “This allows us to have the most intelligent and reliable robot that really knows its environment and is a bit socially aware so that it can have the right etiquette on the sidewalk and get around,” Delaney said of combining sensors and maps. Marble robots were designed to get around on their own, but they will have human escorts during the roll-out. Robots are also wirelessly linked to operators who, from Marble’s office, virtually ride along. “We have basically eyes and ears there,” Delaney said. He described the robot cargo compartment as being as safe as a typical car trunk. When robots arrive with food orders, customers get text messages containing codes to enter on key pads to unlock lids. “We are always looking for innovative new ways to give diners what they want: efficient and affordable food delivery,” said Yelp Eat24 delivery operations head Shalin Sheth. Marble robots are built by the startup, which would not disclose how much they cost. A revenue model had yet to be put in place. The delivery service launched Wednesday was described as a step on the path to perfecting the robots. “Our long term goal is to drive down costs; make this something that is useful in every city across the globe for those kinds of neighborhood-centric deliveries,” Delaney said. Marble saw ground delivery robots as filling a need for quick, inexpensive neighborhood deliveries in cities or other urban settings, freeing humans to tend to long drives or large orders. “We think this is the sweet spot solution in urban environments; a very courteous , slow moving, safe, ground-based helpful robot that goes door to door,” Delaney said. Rules regarding robots on sidewalks are still in flux and the startup is working with local regulators and community groups, according to Marble. The startup on Wednesday also announced it has raised $4 million in seed funding from investors including venture capital firms Eclipse, Maven Ventures,and Amplify Partners. “With the rapid growth of the on-demand and e-commerce markets, solving the last mile delivery problem is incredibly important,” Eclipse general partner Greg Reichow said in a released statement. The funding will be used to continue developing the Marble robot fleet and expand service, according to the startup. Marble co-founders Delaney, Jason Calaiaro, and Kevin Peterson met at Carnegie Mellon University’s robotics institute, where they worked on self-driving cars. They also developed autonomous space robots and moon landers to compete in competitions such as the Google Lunar XPrize.